You should visit Ironbridge. Advertised as ‘the birthplace of the industrial revolution’ (not technically true), there’s heaps to see – but it’s also very pleasant to simply wander round the attractive town, take in the atmosphere, indulge in a modest amount of retail therapy and have a tasty pork pie from one of the shops that sells them in the high street. We purchased a wonderful fridge magnet too – though I strongly suspect it was made in China. 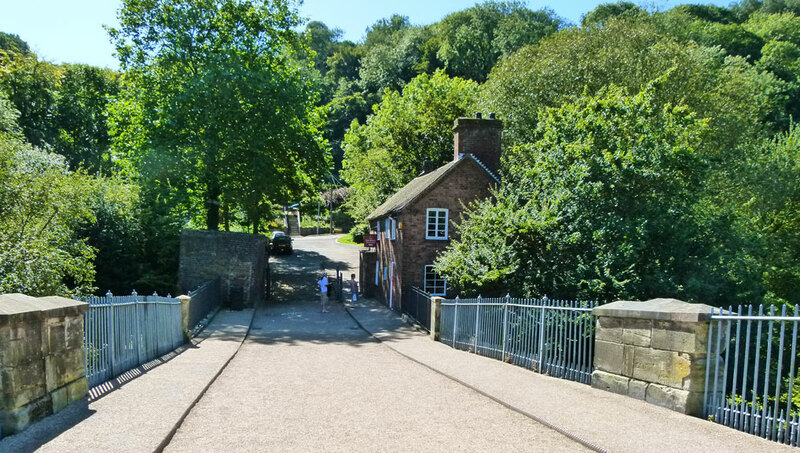 Ironbridge Gorge was created 15,000 years’ ago during the last ice age and today is a UNESCO World Heritage Site (just like the Vatican and the Great Barrier Reef). It was a hive of industrial activity since at least the 16th century. The area had workable deposits of coal, iron ore, clay and limestone. Moreover, the river Severn, Britain’s longest river, rising in mid-Wales and flowing more than 200 miles through the English Midlands to spill into the Bristol Channel, provided both a supply of water as well as a highway to the world. Industrial growth in Britain was geographically widespread (see Britain’s industrial revolution for a bit about this), but it appears to have taken off in Ironbridge largely because of one Abraham Darby the First. Abraham Darby was a manufacturer of cooking pots. But in 1709 he perfected a means of smelting iron ore using coke, rather than charcoal, in Coalbrookdale, a village in the Gorge. This process was far more cost-effective, which made Abraham’s pots and other cast-iron objects cheaper and revolutionised the production of good quality iron. Darby died young, aged only 39, but his legacy lived on. His business graduated to making cylinders for steam engines and, by 1768, was making cast-iron rails for railways. His grandson, Abraham Darby III (the family’s imagination obviously didn’t extend to children’s names) built the iconic iron bridge, the first in the world to have an arch made of cast iron, in 1781. It took two years to construct and has a span of 100’. It used to have a toll on it, did the Iron Bridge. 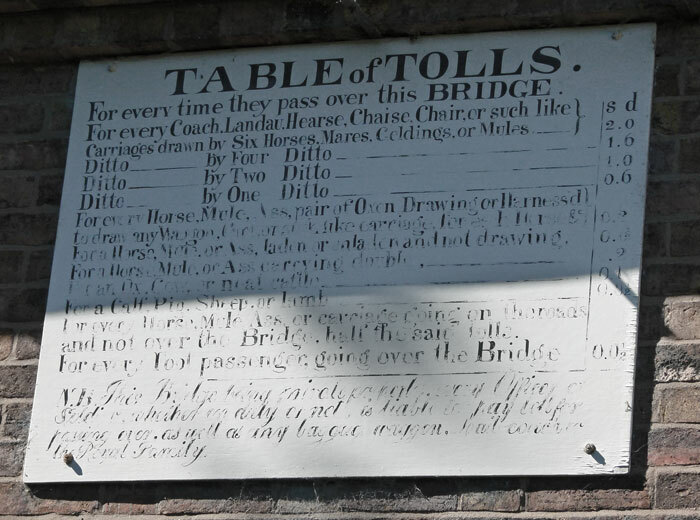 The toll house is still there, and the board telling you what the charges used to be. These days you can walk across for free – provided you make sure to buy a pork pie (only joking). 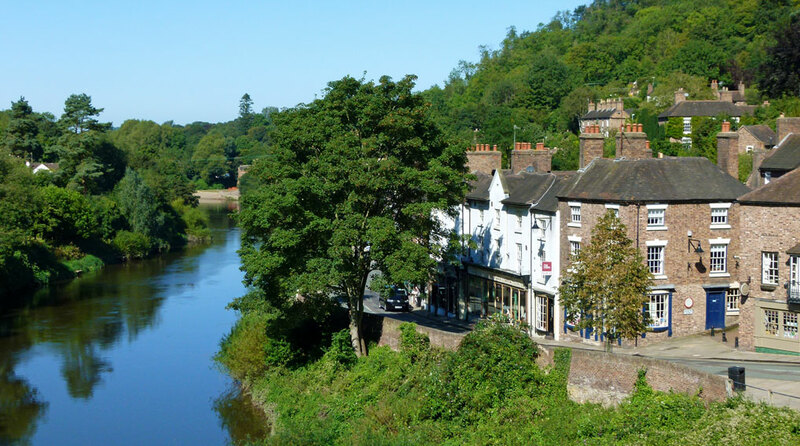 The Ironbridge Gorge Museum Trust runs ten different museums in the area, offering an enormous variety of insights into this remarkable area. The Museum of the Gorge, in Ironbridge itself, includes a fascinating 12 metre long model of the gorge as it was in 1796. Go to A Bit About Britain’s directory listing for Ironbridge. I loved visiting Ironbridge and found the bridge an amazing and beautiful work. I was warned off from pork pie by a man and his wife who were vacationing there from the far-off land of Stockport. Beautiful photos. I would go there again. Great photos of Ironbridge. As a local I have visited the area on many an occasion. We walked across the bridge on one of our earlier trips to England (trying to make sure we saw something besides gardens)! Enjoyed the hostiry. So true our souvenirs are made in China. LOL my boys always try to find something made in the area we visit….it is hard to find. Do you collect magnets of the places you visit? We do, so I thought that fun you wrote about it. Probably not a place I am going to visit any time soon (too far away from Yorkshire for my holiday), but it looks very nice and deserves to be on the UNESCO world heritage list. Interesting looking bridge. I don’t believe I’ve ever seen that type of style before. It would be fun to visit and eat a pork pie. Just love the fact you may walk the bridge … for the price of a pork pie! The Pork Pie shop looks great in your photo! That does look like a beautiful place to visit.